We have a lot of cameras around the property, both for security and for watching the wildlife. The main limiting factor is the bandwidth of the internet connection, which is a wireless link over 6km long provided by SCC Broadband.The image on the left is a snapshot from the camera, if you refresh your browser it will reload. 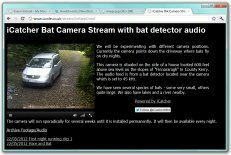 The only streaming webcam we currently have up and running is the "bat cam" which is available on the link below.